Each era of Italian violin making has produced a handful of makers whose work is today rated far higher than that of their contemporaries. Hence Nicolò Amati, Antonio Stradivari and Guarneri ‘del Gesù’ dominate the classical period, Giovanni Francesco Pressenda and Giuseppe Rocca are considered the greatest 19th-century makers, and in the 20th century we have Annibale Fagnola and Stefano Scarampella. Scarampella (1843–1925) fully deserves his reputation as one of the finest 20th-century makers. Those familiar with the great Italian masterpieces find themselves seeking similar artistry in other instruments, and many of Scarampella’s models satisfy that craving. A fine Scarampella is perhaps the youngest instrument to meet a soloist’s demand for a projecting yet noble tone. Not all his instruments find equal favor with collectors due to a tendency at times toward haste and crudeness, and the occasional use of inferior materials, but his best works speak for themselves. Time will tell whether they can compete with the best 18th-century instruments, but it already seems highly likely. Despite the differences in their stature and backgrounds, there is a temptation to draw a parallel between Scarampella and ‘del Gesù’: both managed to express their creative talents without concern for meticulous workmanship or dogma, defying and even caricaturing many aesthetic principles of their predecessors. However, unlike ‘del Gesù’ who was bred in the tradition of violin making, Scarampella did not become a professional violin maker until his late 30s. Born into a poor family in Sant’ Alessandro, Brescia, he initially found a vocation as a joiner. His father, Paolo (1803–1870), appears to have been an amateur violin maker, while his elder brother, Giuseppe (1838–1902), refined his violin making in Paris and had settled in Florence by the time Stefano embarked on his violin making career. Scarampella lacked both traditional training and a professional environment in which he could absorb influences directly from colleagues. By the end of the 19th century both Brescia and Mantua had lost their great violin making schools and existed in the backwaters of the trade. Scarampella thus achieved his spectacular results in near-total professional isolation. Although he presumably received some rudimentary instruction from his brother (and his labels always state that he was a pupil of Giuseppe) this was probably via their intensive correspondence. In 1863 he had copied for Giuseppe the 1786 work by Antonio Bagatella, Regole per la costruzione de’ violini viole e violoncelli (Rules for constructing violins, violas and cellos), suggesting that he already had a keen interest in violins. 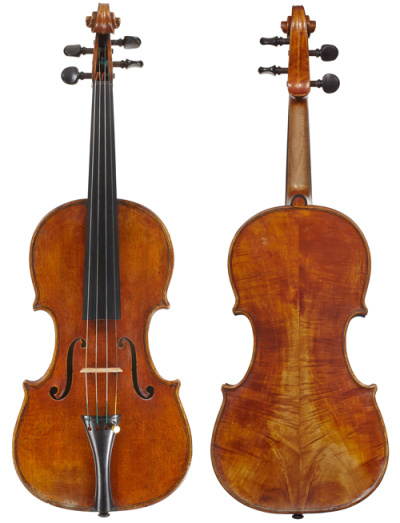 Though no instruments clearly by Stefano are known from much before 1890, it is likely that he dabbled in violin making or repairing from the early to mid 1860s while living in Brescia, where he was registered professionally as a carpenter and also a shopkeeper. The first official archival mention of him as a ‘carpenter’ comes in 1880, and the following year he is listed as a ‘carpenter and string instrument repairer’ (Stefano Scarampella, Eric Blot, Eric Blot Edizioni, 2002, p.38). Scarampella married Rosa Marianna Panada in 1869 and the couple had two children, Luigia (born 1871) and Paolo (born 1878). Rosa died in 1882, leaving Scarampella with the job of raising two young children, probably alone as he never remarried. Luigia was destined to become a nun, while Paolo became a cellist and settled in France around 1898. In 1886 Scarampella moved to Mantua. Here he began by working at the steam tramline Ostiglia–Mantua–Brescia. In about 1890 he is registered in Mantua as a ‘carpenter, engineer’ and a little later that year also as ‘violin maker’ (Stefano Scarampella, Eric Blot, Eric Blot Edizioni, 2002, p.39). From then on he appears to have devoted himself entirely to violin making. In 1890 he participated in the Mantua ‘Arts and Crafts’ competition, where he was awarded a silver medal for some of his violins, but it does not appear that he later participated in international exhibitions or competitions, unlike most of his prominent contemporaries. Scarampella returned to Brescia at intervals during the early 1890s and made violins in both towns, but his various moves to different addresses in Brescia and Mantua suggest that his finances were shaky. In 1898 his address in Mantua was registered as via Tazzoli 13 and he also had his workshop here until 1919, when, probably requiring a larger space, he moved to via Accademia 19. That same year he took on his only official apprentice, the young Gaetano Gadda. Giuseppe Scarampella died in 1902 and passed his tools, forms and varnish recipes on to his younger brother, who was nearing 60. Only then did Stefano’s mature and most creative and productive period begin, lasting until about 1915, though on occasion he was capable of turning out a true masterpiece as late as 1918. Scarampella was known for modesty and dedication to his work. His self-image was almost certainly affected by his admiration for his brother, whose own fine work is, in my view, inferior due to a lack of spontaneity and the radiant varnish of Stefano’s instruments. He neither promoted himself, nor did he seek out success. He appears to have rather undercharged for his instruments and, according to the Gazzetta di Mantova in 1913, he refused to work for anyone he did not like. He consequently lived and died in poverty, yet left us with some of the finest instruments ever built. Early Scarampella instruments made in Brescia and Mantua in the late 19th century hint that he was still searching for direction. These instruments are often misunderstood and poorly attributed as they are rather different from his later, more plentiful works. They are not dissimilar to those of Raffaele Fiorini (his older Bolognese contemporary) in their treatment of the heavy purfling, continuing to the end of the corners with long and rather graceless bee stings. The sound-holes are positioned straighter than usual and curve strongly at the tops and bottoms, and the arching is slightly more pinched, recalling the Rogeris of Brescia. The varnish of these early instruments tends to be of a yellow-brown color. By the mid 1890s his style changes somewhat: the corners shorten, the purling roughens, losing its bee stings, and the varnish begins to acquire a more striking reddish-orange color, foreshadowing Scarampella’s legendary achievements in that department some years later. The maple of these instruments is normally of the cheap, local type – either quite plain or showing sporadic flaming and inherent defects. Early Scarampella instruments made in Brescia and Mantua in the late 19th century hint that he was still searching for direction. Scarampella’s most successful model, adopted in Mantua after 1900, was initially entirely based on that of Giuseppe, whose work was primarily influenced by the ‘del Gesù’ model. He must also have discovered Tomasso Balestrieri’s works and quickly adopted their wonderful orange-red varnish – pasty, transparent and glowing. He seems to have adopted Balestrieri’s free and easy way of working as well and the flatter, broader arch associated with the master’s later works. In his later work Scarampella ingeniously fused the above influences with the thinner-waisted, elegant form of Giuseppe Dall’Aglio, giving his C-bouts a somewhat triangular shape. This is perhaps the only feature that lends his rather heavy models a hint of delicacy. He generally worked on a large model of 357–358mm body length and his plates tend to be quite thick. His varnish is never too soft, even in his early works, and has a gummy, pasty quality one associates with the older Italians. It is never antiqued or shaded. Scarampella’s best work, from about 1905 to 1910, shows most of the characteristics of his mature period: the edges flatten, the models broaden, the corners gain character, the varnish intensifies in color and texture, and a strong and sure hand shows itself in the overall workmanship and concept. On some instruments Scarampella adopts back pins, but later he abandons this trait. The bold, hastily carved, wide-chamfered volutes and the heavily wooded peg-boxes, often wide at the lower back and finishing bluntly in a vague triangle, captivate the onlooker with a unique and sculpted effect. No Scarampella scroll is completely like another, suggesting that he made them (and probably his instruments) one at a time, as opposed to the more common practice of making several simultaneously to speed up production. Other recurring elements include the fluting of the lower sound-holes with a single, decisive gouge of the knife; the characteristic file marks – 1mm thick – left unsmoothed, especially on the ribs; and the nearly always asymmetrical distribution of wood for the two-piece backs, which is visible at the buttons (one side having more wood than the other). By around 1905 Scarampella’s purfling becomes reminiscent of that of the older Italian schools in its quickly executed appearance and also in the way it expands and fades over time, like those of ‘del Gesù’ and Turin-period Guadagnini. 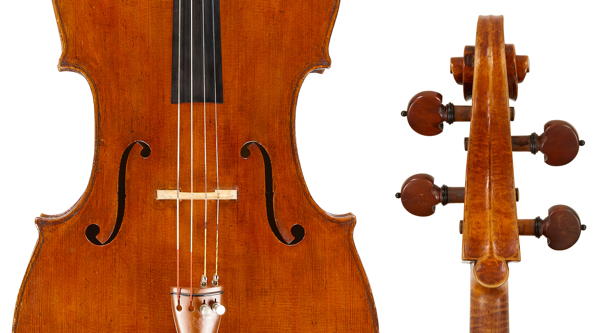 Scarampella’s extremely successful cellos, of which he made perhaps 20 before 1915, have rather upright sound-holes and do not follow the ‘del Gesù’ pattern of his violins. The backs of the scrolls end in a round bottom, à la Dall’Aglio. 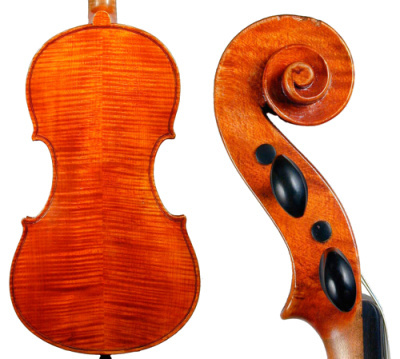 The more numerous violas, which are unfortunately mostly built on a smaller model, generally use the same technique for the backs of the scrolls. By about 1918 Scarampella began to lose his manual dexterity due to arthritis. His varnish begins to decline too, tending towards quicker application and thus showing less complexity in its color and texture, while his corners gradually become stubbier and the archings stiffen. During this final period he increasingly worked in collaboration with Gadda but he still constructed a few instruments entirely by himself. These are very different from the works made with Gadda: narrower, heavily plated, rather roughly finished and stiffly arched, with a harder varnish of an intense color, and some with original, filled woodworm damage in the tables; yet they still exude a charm found in every instrument by Scarampella’s own hand. Instruments made entirely by Scarampella largely disappear after 1920 and less than a year before his death in 1925 he signed a formal agreement with Gadda whereby the latter would inherit Scarampella’s entire collection of moulds and forms provided he furnished his master with one new instrument a month. The fairly large number of the ‘collaboration’ instruments made before this agreement are closer to Scarampella in model and arching than Gadda’s later copies of his work and indeed it can be tricky to distinguish them from Scarampella’s earlier production, as some of them were perhaps later back-dated. It is more likely that the few instruments made under the 1924 contract were entirely Gadda’s work, whereas the earlier instruments had more of Scarampella’s input. A fine maker in his own right, Gadda was naturally familiar with Scarampella’s technique and styles but in his personal work he did not copy his master slavishly, and his instruments are recognisable as his own even when they bear Scarampella’s labels. Despite his lack of self-promotion, towards the end of his life Scarampella attracted various followers. Some of these, such as Riccardo Cerutti of Marcaria, Antonio Pivetta, Oreste Carpi, Oreste Martini, Dante Guastalla and Amedeo Simonazzi, were either local makers or from neighbouring Emilia Romagna seeking direction. Others such as Gaetano Sgarabotto and Enrico Politi were quick to appreciate Scarampella’s genius and made replicas of his instruments perhaps as early as the late 1920s. After Scarampella’s death at nearly 82, Gaetano Gadda and later his son, Mario, and his pupils made a large number of fine Scarampella copies. Many of these, in particular those by Mario, were made with the intent of passing them off as original; they bear convincing Scarampella labels, some inherited by Gaetano and others skilfully reproduced by Mario. 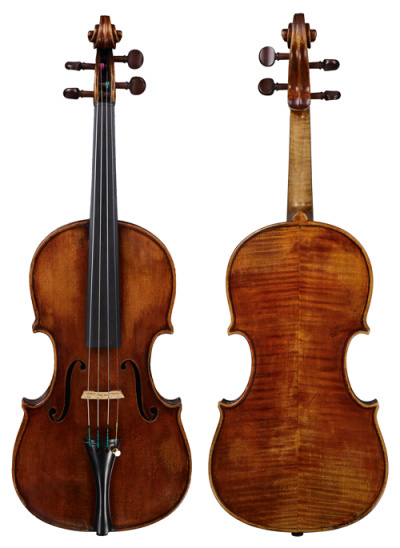 This makes it difficult to calculate Scarampella’s production accurately and some estimates of over 800 instruments are clearly exaggerated; however, he was unquestionably one of the most prolific violin makers of his era, despite having a professional working span of less than 30 years.